Sarah Sarah quit her social work job to become a stay-at-home mom when her twin girls were 1, their older sister was 2, and her husband graduated with his doctoral degree and got a full-time job as a professor (aka could not stay home with the kids on his days off of school, and full-time free childcare from wonderful grandparents was not an option!). Now the twins are 4, their big sis is in kindergarten, they’ve added a baby brother to the mix, and Sarah is getting back into part-time Geriatric Care Management. She loves spending time outdoors and trying her best to do crafty, educational activities with the girls, including reading tons of books with them! If you would like to contact Sarah, e-mail her at mumblingmommy@mumblingmommy.com. There it sits in my son’s room: a special chair. Not a wheelchair exactly, but one that will hold his hypotonic (low muscle tone) body in place as we go for a stroll or work on feeding. I’ve been waiting for its arrival, as I know Walt likes to be in a seated position but with his weak core muscles and poor neck and head control, it’s hard to keep him upright. These are things experienced daily as a special needs parent. When the technician came to measure Walt for his chair, I remember being delighted that it looked so much like a regular stroller. It looks different now as it sits in his room, much more like a “special needs” chair – I don’t even know what the correct terminology for this is; it’s all still very new to me. I guess this is what comes with being a newly made special needs parent. 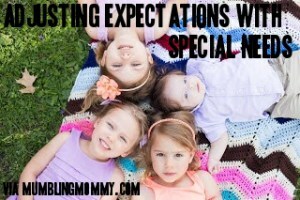 What Can I Expect as a Special Needs Parent? I was and still am afraid for my son to be seen as “different,” and pushing him around in this special chair will show everyone we meet that my son is “different” and has “special needs.” I’m always nervous to talk to others when they ask about him, never sure how much to share. I don’t want to scare or overwhelm them, but I also feel that I should not hide or downplay Walt’s medical and developmental issues. I worry about what things will be like as he grows older, and if other kids will make fun of him. I take some comfort in his three protective sisters’ unconditional and enthusiastic love for him, and I hope that it will create a bit of a protective bubble for our son. Even when he went to the NICU, after months of testing while Walt was still in utero, I felt that everything would be fine. I thought that he was just going to the NICU because he needed some extra oxygen. 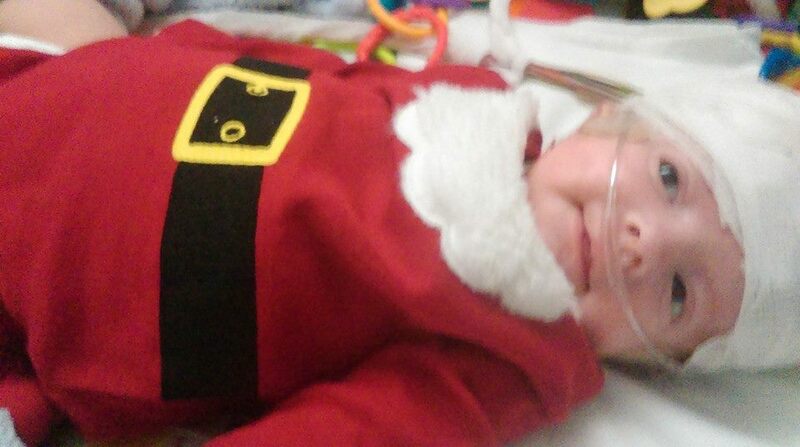 I spent Christmas Eve (our third attempt to take our baby home, and the closest we’d gotten yet) at home alone, catatonic with grief and fear, anxiety, sadness, uncertainty, as he had one apneic seizure after another. During these seizures, he would stop breathing and become still and gray, and the medical staff would have to do a “bagging” procedure to force some oxygen into him. I would just stand by and watch, as his heart rate dropped. Walt spending Christmas day hooked up to a 48-hour EEG to monitor seizure activity. I felt certain that he was going to die that day, as his seizures grew longer and longer, and I could not bear to be there to watch them anymore, yet I truly felt I needed to get there to hold him one more time and say goodbye. I’m so grateful to the amazing NICU nurses and doctors who finally sent my exhausted husband home and to my wonderful husband who managed to get a somewhat normal Christmas together for our girls, who had been so excited about their brother coming home. Well, there it sits, looking more like a special chair than a regular stroller. Sleepy Walt getting fitted in his new chair. Although I am nervous about having to answer questions about my son, about being a special needs parent, or others wondering about how and why he is “different,” I find myself a little bit happy and maybe even a little excited about it, because I know that my son will love sitting in a much more supported upright position. This chair will help him, and I will continue to learn how to navigate this new “special needs world” and adjust my expectations as a special needs parent and accept the changes that will come, as hard as it may be.